Lewis Hamilton's two consecutive victories in races Ferrari was expected to dominate have swung the title battle pendulum his way. The Mercedes driver arrived in Hockenheim trailing Sebastian Vettel by eight points and left Budapest, ten days later, leading the championship by 24 points, a swing of 32 points in his favour, that came on tracks where he was supposed to lose ground. A superficial look at those numbers could lead you to believe this championship is going Hamilton's way, especially if you think that it was precisely after last year's summer break that the Mercedes driver took control of the situation, winning five of the next six races and opting against fighting Verstappen in Malaysia, to secure an important second place, in a race where Vettel was starting from the back. However, what happened in 2017 - in fact, every trend that has been set since 2014 - cannot be applied to this year's championship, by the simple fact it's Ferrari that clearly has the better package and, even more to the point, it's the Italian Power Unit that dominates in its area, a complete reversal of what we were used to seeing since the start of the hybrid era. What this means is that while until last year Mercedes would go to Spa-Francorchamps and, especially, to Monza, pretty much certain of winning in those tracks, that's no longer the case in 2018. Since the start of 2014 only once Mercedes lost a Grand Prix in one of those circuits, precisely in the first year of the current set of engine regulations, in Belgium, after what turned out to be the first of many incidents between Lewis Hamilton and Nico Rosberg. This year, though, there's no reason to doubt Ferrari will go into the Ardennes as the hot favourite and such is its straight-line speed advantage that it's difficult to see how the Scuderia can lose it's home race, at the start of September. Then will come Singapore, a track where Mercedes has really struggled in the last three years, so it won't be surprising at all if by the middle of September the gap between Hamilton and Vettel in the championship will have been, at best, erased. 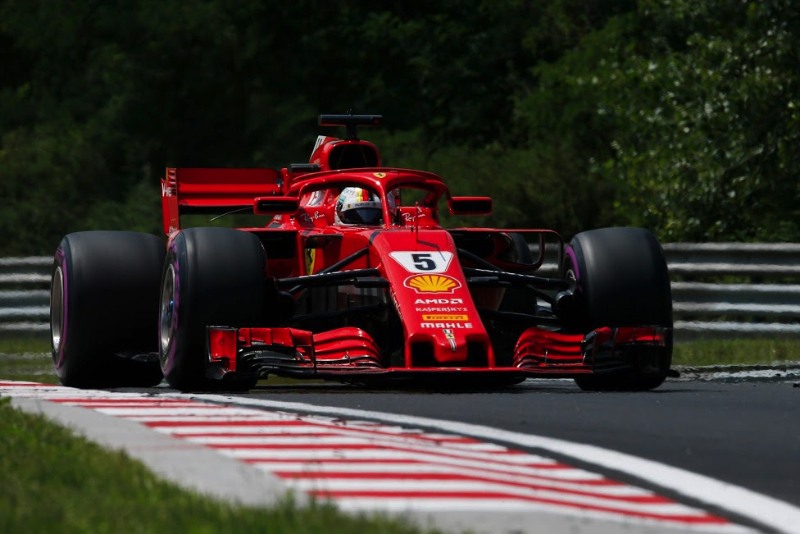 On Sunday afternoon, in the Hungaroring, Sebastian Vettel was remarkably relaxed for a man that, for the second weekend running, had just lost a race he should have won. Had he done a better job in qualifying, he would have, at least, started the race from the first row of the grid and from there he would have had a much better shot at beating Lewis Hamilton on Sunday. But he didn't, qualified only fourth, overtook a quite passive Kimi Raikkonen during the first lap of the race and then had to fight very hard to get past Valtteri Bottas into second place, five laps from the end of the race. Still, the German was calm and collected, knowing he has the best car and all the chances to still win this championship, provided he and Ferrari stop making mistakes and throwing away important points in all the remaining nine races of this season. In his words, "as we've seen this year the pendulum seems to swing once this side, once that side. Obviously if it's like this, consistency is the key. I didn't do myself a favor last week but I think that's part of racing. Stuff happens. Compared to last year, we lost the championship, I think, because our car wasn't quick enough to be a match in the final part of the season, despite what happened with the DNFs. So, I hope that this year, and I think this year has shown so far that our car is more efficient, our car is stronger and still has a lot of potential to unleash - so I'm quite confident with what's sitting in the pipeline, that we can improve. So, we'll see. Should be an exciting second part of the year." What Ferrari cannot afford is any more mistakes. In Hungary alone the Scuderia and Vettel made a number of small mistakes that, when accumulated, turned what should have been a relatively straightforward one-two finish, into a defeat that will resound in Maranello throughout the summer break - four long weeks of lingering on what might have been. First of all there was the way the team performed in Q3, after Vettel had completely dominated the first two qualifying sessions. The German admitted there was nothing wrong with the tyres or the car but that he was simply not quick enough in much wetter conditions than what he'd experienced in Q2. But Ferrari should have still managed to get pole position with Kimi Raikkonen, who led after the first run in Q3, had he not been stuck behind one Haas during his out lap, something that compromised his ability to warm up the tyres in the best possible way, so instead of starting from pole he was down in third place. Then came what was, for me, Ferrari's biggest blunder of the weekend, when the team kept Vettel out until lap 39, when it was essential he'd pit for the Ultra Soft tyres and return to the track ahead of Valtteri Bottas, in second place. The Italians knew they needed a 20/21s advantage on track to stop for tyres and still remain ahead of the second Mercedes driver and from lap 26 onwards, Vettel had a big enough lead over Bottas to stop and resume still ahead of the Finn. Obviously Ferrari was trying to minimize the number of laps done on the Ultra Soft compound, but could also see Hamilton had done 25 laps on those tyres, Magnussen had got up to lap 31 and Gasly to lap 32 on the Ultra Softs without losing much grip - and that starting with a heavy fuel load. Logically, it should have been relatively easy for Vettel, on little more than half a tank of fuel, to do a little bit more than that - maybe 36 or 37 laps - on the Ultra Soft tyres. For a while the gap to Bottas continued to grow, peaking at 26,399s on lap 34, so Ferrari's gamble of starting Vettel on Soft tyres was working. Then came a bunch of back-markers Vettel's way - Grosjean on lap 35, Sainz on lap 36, and Ocon on lap 38 - and suddenly the gap was down to 20,708s, so on the edge of Vettel's pit stop window. As Bottas also made ground on lap 39 - he was 0.7s quicker that the German over the first two sectors of the lap, Ferrari had already lost the battle before Vettel entered the pits. A slow pit stop only compounded their wounds, but the mistake had been done on the five or six previous laps, throwing away what was, for all intents and purposes, a open goal opportunity.